SHORT & SWEET: The 18th Birthday at Whale Beach. Thank you for visiting the blog. Lots of pictures and stories to go with them. Contact can be made through the website - see link below. The 18th Birthday at Whale Beach. Well I am back at home after a quick trip to Sydney with Ken and Mavis to attend the 18th birthday of their grandson Matt. The cake was a joint effort where Mavis baked a superb chocolate cake and I decorated it. Decided on something which would travel well - a party theme. The result was stars and streamers on a white cake supported on a black fondant covered board. 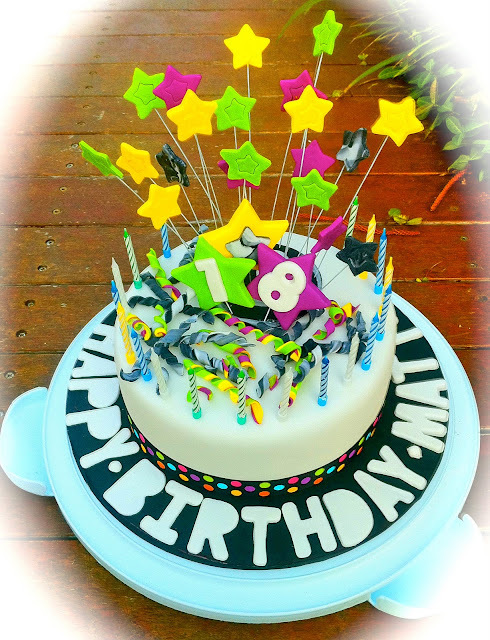 Travelled by plane - THANK GOODNESS for the Wilton cake carrier as the cake travelled beautifully - but nearly lost it at Sydney airport - it was nearly mistaken for a suspicious incendiary device. Anyway all ended well and the authorities released it after checking for explosives! [I have embellished this story somewhat!] Anyway I was a bit stunned at the positive attention it attracted from perfect strangers who were also travelling. Shucks I should have had some business cards handy!! The cake then went to Whale Beach [N Beaches Sydney] A very special place to have an 18th birthday party. Thank you the Downing family for inviting me to decorate a cake and attend the birthday bash.